The homepage features a slideshow gallery that advances automatically and displays photographs that do not appear anywhere else on the site. Until the move to Squarespace, I was a hand-coder. Yes, I can admit it, I hand-coded my website. Even over many years and many iterations of jfwphoto.com, I continued to hand-code. Most recently it was a fairly simple site, one page deep and featured a java slideshow, my twitter feed and links to everywhere else you could find my work. It wasn't horrible, but it also wasn't anything I was particularly proud of or special and more to the point, I wasn't really driving anyone to the site. I realized a while ago that it was time to get serious and finally have a website that I actually wanted to share with others and for that reason I made the move and relaunched my presence on the web. Here are five reasons I made the switch from hand-coding to Squarespace. 1. One location for everything. 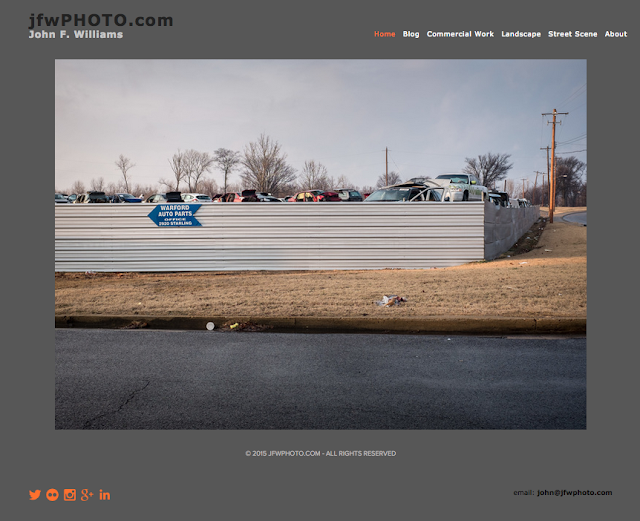 It gives me a true presence, one URL, that I can now share which will highlight my photography, provide some information about myself, AND still provide a launching point to social media. There is still one BIG thing I have not yet moved, though. This blog. I do plan on eventually incorporating it and Squarespace offers step-by-step instructions on how to transfer most popular publishing platforms, including Blogger, into their framework without breaking links, etc. I just need a little more time. I'm using the About page to also provide links to tear sheets and affiliate links. 2. The content management system. I'm already an admitted hand-coder, therefore I know HTML and can build a website from scratch, but the reality is my skills will only allow me to build sites circa 2005. The web is so much more dynamic these days and having the ability to update a site quickly and easily was important to me. Squarespace makes it easy through their CMS and once you understand how it works, you can update or make changes in only a few minutes. I admit that I dove right in during the two-week trial and became a bit frustrated. However, once I took a step back, watched some tutorials, and looked at other Squarespace sites that used the same template I choose, the process of building my site became very easier. 3. A wide selection of templates. The first thing that drew me to Squarespace was seeing other photographers using the platform. I liked the variety of templates, how most designs were clean and simple. One downside to temples, of course, is that all sites can begin to look the same. To make your site stand out, Squarespace gives you the ability to use custom code which I've started to incorporate and eventually is what I hope will make my site stand out. Also, switching between templates, even after your site is built is really easy to do and makes it possible to experiment with different looks. 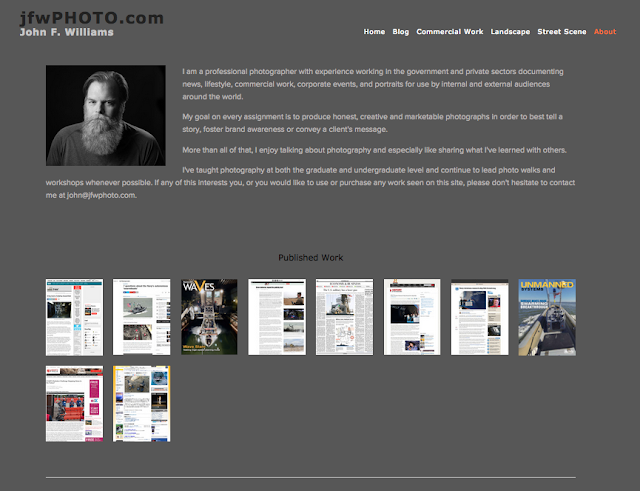 This is typical of my gallery pages where I offer both navigation arrows and thumbnails. However, the commercial gallery seen here is the only place I offer full caption information on every photo. 4. Mobile devices. 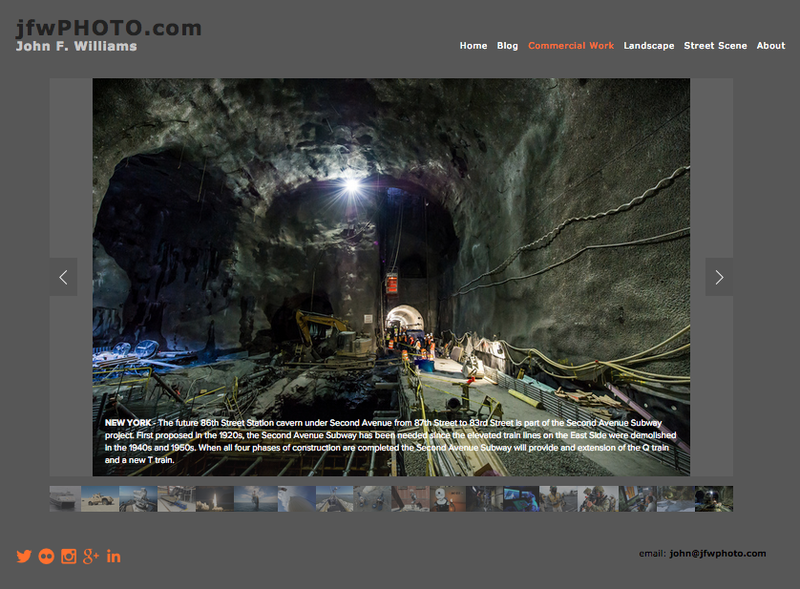 While I don't have current metrics on jfwphoto.com as proof, it is my belief that most people will be accessing my site on their phones or tablets. While not always ideal, having a website that scales and displays properly on a small screen is critical. Squarespace does a really nice job with this and I love how it looks on my Samsung phone and Apple iPad 2. I already have shared my site with others in this manner. 5. Support. Let's face it, it's nice to be able to call someone when you have a problem. It's also nice to be part of a user base that offers inspiration, advice, problem-solving and provides customization tips when needed. Squarespace is well established, hasn't stagnated and continues to be one of the leaders in providing website services to photographers and other creative people. With all the previous versions of my site, I would build it then and mostly forget it. However, with Squarespace I find myself revisiting every couple days, making small changes, or adding more photographs, or experimenting with styles. Why? It's easy. And that's what it really comes down to after all, ease. A website that doesn't change or one that you don't use because it is too hard to update is a waste of a URL and does nothing to promote you or your photograph. So stop putting it off and give Squarespace a shot.